Dear Abby, Dan Savage, Yoda, fortune cookies – there are plenty of sources (both conventional and unlikely) of useful advice, guidance and wisdom. But where do you go when you need help crafting a content marketing strategy that will put your brand on a tier way above the competition? With so many SEO, content creation, social media, analytics and digital marketing experts out there in cyberspace, collecting all of their valuable nuggets of wisdom could take days, weeks, even months – or at the very least, the better part of a Monday afternoon. Well, you’re in luck, because we’ve done the heavy lifting of scouring the internet for all of the most valuable content marketing tips, advice and pointers to guide your 2019 campaigns. To round out this list, we’ve even asked some of our own content marketing experts here at Brafton to share their own bits of wisdom. 1. Make your content relevant to your target audience. That may sound somewhat obvious to the savvy readers of the Brafton blog, but it can be tempting to chase whatever the latest viral sensation or trending topic is to get a bunch of clicks and a quick but short-lived influx of traffic to your site. Those short-term gains won’t last, though, and you’ll need valuable, relevant content to keep your audience’s attention and guide them along the buyer journey. 2. 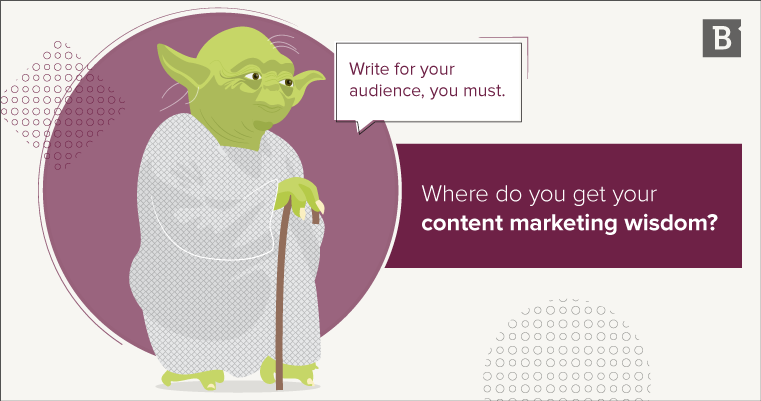 Start documenting your content marketing strategy. Did you know only 39 percent of marketers have a recorded content marketing strategy in place? That’s despite the fact that 65 percent of successful content marketers comprehensively document their plans in advance. Taking that first crucial step gets everyone on the same page regarding campaign goals, key performance metrics, content needs, target audience, the role of each piece of content, etc. Sure, you could hash all of that out in a couple of meetings and hope that every marketer, writer, designer, videographer and social media specialist on your team keeps that plan in mind throughout your 2019 campaigns. Or you could document the whole thing so there’s always a roadmap to reference along the way. Only 39 percent of marketers have a recorded content marketing strategy in place. 3. Get to know your brand. A lot of marketers chafe at the idea of talking about themselves – or more accurately, their brand. For good reason, too: No one really wants to hear a brand brag about how amazing it is. But you still need your brand’s messaging to permeate your digital marketing strategies and show site visitors, blog readers and potential customers precisely what your business offers that others don’t. That may be a strong customer experience, high-quality services or products or a long, heralded track record of success. You need to tap into those value-adds and place them front and center in your content marketing strategy without veering into salesly territory. It’s a tough balance to strike, but no one ever said this stuff was easy. 4. Extract more value out of your content. By that we mean explore opportunities to repackage high-performing content in other formats. Have a blog post that’s really engaging readers? Expand on those discussion points in a more in-depth eBook. Take that incredible brand story video and create an infographic out of that messaging. There are lots of ways to reshape existing content in different forms that are suited for each stage of the sales funnel. It lets you wring more value out of those ideas and reduces the amount of work needed to craft new content from scratch. 5. Branch out into new content types. We all know that blog posts are great ways to deliver organic traffic to your site and that gated content like eBooks and white papers are perfect for capturing qualified leads, but you don’t have to limit yourself to the classics. Try exploring other content formats that will help you build awareness and tell your brand story. In 2018, we launched the “Above the Fold” podcast to showcase our brand’s unique take on the digital marketing industry and reach an audience that may not have time to read written content during the workday. If you aren’t already including video as a core part of your content marketing strategy, what are you waiting for? And even if you are using video, could you be doing more with that content? Most likely. After all, 70 percent of B2B marketers believe video drives more conversions than other content types. It’s video’s world, and we’re all just living in it. 7. Go ‘micro’ with your social influencers. Social influencers are a pretty touchy subject for digital marketers, with some swearing by their effectiveness and ability to build brand awareness across a large audience, while others cast a long sideways glance at the practice. If you’re going to take part in the social influencer game, be smart about it and – pay attention, B2B brands, this is directed at you – use micro influencers. A big name will lead to a bigger audience, but there’s no guarantee their followers will be receptive to your brand messaging. Not to mention, macro influencers often have so many brand partners they’re repping for that they struggle to serve as a believable brand advocate for all of them. If you’re going to take part in the social influencer game, be smart about it and use micro influencers. Meanwhile, micro influencers may have a small band of followers, but it’s a pretty devoted group that listens to what they have to say. It’s the difference between casting a wide net and hoping for the best and taking a more targeted and surgical approach. We’ve seen this play out in other areas of content marketing, where a sacrifice in site traffic is made up for – and then some – by the quality of the audience that shows up. Is “snackable” content dead? Lord, I hope so (or at least as far as the phrase goes). Annoying content marketing jargon aside, you may have noticed that B2B blogs, articles and landing pages are all getting longer. Our own blog content has certainly ballooned in terms of word count in recent years. There’s no big secret to why brands are creating more long-form content these days: It gives you more room to provide more depth to any given topic and touch upon different subjects that will help round out that content, distinguish it from similar blogs and improve your search ranking. So, what’s the ideal length for content today? It depends. Not just on the type (obviously, white papers and more research-driven fare will lend themselves to lengthier tomes), but the specific subject, keyword and audience that you’re targeting. That’s why just about every piece of content we create these days goes through a rigorous mapping process to nail down all the specific qualities it needs to include to serve its purpose. Long-form content gives you more room to provide depth to any given topic and touch upon different subjects that will help round out that content. Ignore that instinct to cram every day of your content calendar with new material. Take the time to research and craft quality content that’s not only relevant to your audience, but teaches your readers something new. 9. Encourage more user-generated content. We’re all protective of our brands and the messaging we put out into the world, but you should still encourage your customers and audience members to take an active part in that conversation. User-generated content – blog and video comments, product reviews, community message boards, customer testimonials, etc. – puts you in direct contact with the people who are reading your blogs, using your products and actively participating in your online forums. You should be listening to what they have to say, even if it’s not always positive. User-generated content helps with topic ideation, measuring engagement, keyword research and establishing that all-important social proof. So, loosen that grip on your brand’s online presence, and let your audience speak for themselves. 10. Fine-tune your buyer personas. We’ll just go ahead and assume that you have buyer personas mapped out already. If you don’t, definitely get on that. It’s 2019, after all. For everyone else, it may be time to do a full-scale review of your buyer personas to see if they still hold up and accurately reflect the people visiting your site and consuming your content. Dig deep, unearth as many details and specifics about these fictitious individuals as you can. Really flesh them out and treat them as living, breathing people – that’s who they’re standing in for. Just as important is understanding the role that each buyer persona plays in the sales process. Are they the decision-maker getting the final say on all purchases? Maybe not. There’s a good chance the majority of your online audience is made up of lower-level influencers who can advocate for your brand, but not make the final decision to purchase. Really flesh out your buyer personas and treat them as living, breathing people – that’s who they’re standing in for. 11. Start creating interactive content. Some of the most forward-thinking and innovative brands in the content marketing world have found ways to move beyond traditional, static content. More and more, we’re seeing companies create interactive graphics, videos, emails, quizzes – you name it. Interactive content offers a refreshing change of pace for digital audiences well-accustomed to the usual parade of blogs, eBooks, newsletters, landing pages, etc. It takes a pretty talented design team to create interactive content, but the experiential benefits are worth the effort. 12. Formulate a creative content brief. For small and large marketing departments alike, losing a key member of your team can derail your content marketing plans and set back your campaigns while new writers, designers, strategists and social media specialists brush up on the finer points of your brand messaging and style. The good news is you can develop institutional knowledge within your content marketing team and minimize the damage caused by unforeseen employee departures by crafting a comprehensive creative content brief that anyone can consult. Not only does it protect your business against employee attrition, but it creates a single guide to answer any questions regarding your brand’s messaging and style guidelines. 13. Think about artificial intelligence. Notice we didn’t say, “invest your entire 2019 marketing budget in a shiny, new AI platform.” It’s fair to say that artificial intelligence-driven software is going to completely change the digital marketing game someday soon. There are tons of theoretical applications for this tech: customer outreach, personalized engagement, lead nurture campaigns – heck, even content creation (*shudders*). But we’re not there just yet. Every year, tech industry pundits come out of the woodwork proclaiming the imminent arrival of AI, and while we are getting dangerously close to “boy who cried wolf” territory here, eventually that day will come. So, while you don’t need to install AI-driven writing software (yet), it never hurts to think about the future, and what that might hold for your content marketing strategy. With these content marketing tips in hand, you’ve got the foundation in place to make your 2019 digital marketing campaigns the most successful to date. The rest is up to you.